Heat Pumps have been around in the USA and Canada for over 50 years so why has their popularity grown so much in the last 10 years? Nova Scotia, New Brunswick, Vermont, Maine and New York all seem to be hot spots in North America for heat pump installations. Perhaps it is the combination of a perfect climate for a heat pump combined with higher than average energy costs? Or perhaps is it that installers and contractors feel confident that a heat pump in Nova Scotia will work better than any other type of heating option? When a recent heat pump customer in Maine was asked about why he purchased a cold weather heat pump his answer was because my neighbor purchased one of your heat pumps last year. So perhaps it is the “Jones” effect that people are buying cold weather heat pumps in North Eastern USA more than anywhere else simply because their neighbors are buying them and it has reached a critical mass? Both ways the fact remains that Nova Scotia, New Brunswick, Vermont, Main and New York State all have seen an explosion in cold weather heat pumps nearly tripling in the last 10 years. This is not to say the rest of the county such as California and Canadian provinces such as BC and Ontario are not also seeing similar heat pump growth. Worldwide the growth of air to water heat pumps has surpassed all other types of hydronic heat pumps including geothermal heat pumps, yet in North America a hydronic air to water heat pump is relatively unheard of? Why such a difference? One of the reasons is that North America is very slow to adopt hydronic heating as a superior heating source versus traditional forced air. Another is that European building standards are simply higher than North American and as such more focus and investment is put into heating and cooling system such as heat pumps in Europe? What about cost? Cold weather inverter heat pumps have dropped substantially in cost worldwide as their production number rise. Economies of scale always play an important role in the adoption of newer technology. As more and more compressor manufacture add Enhance Vapor Injection (EVI) and DC inverters to their product line ups the completeness and rives down cost. It used to be that the only EVI manufacture was Mitsubishi, now almost every manufacturer has a competing cold weather compressor. The cost of an average cold weather heat pump installation in Nova Scotia using radiant floor heating is about $10,000 USD this is less than ½ the cost of a similar install 10 years ago and performance of the heat pumps have nearly doubled in the same time frame making the ROI that much more attractive. Could grants and government funding play a role in the growth of air to water heat pumps in areas such as New York, Nova Scotia and Maine? Let’s look at the government grants of heat pumps in these regions. Many other states such as Vermont, California, and Michigan and Ohio all have grants available for air to water heat pumps. One of the best sources for grants and funding can be found on the Database of State Incentives for Renewables & Efficiency (DSIRE). For a detailed list of programs listed State by State visit www.dsireusa.org. As you can see only heat pumps in Nova Scotia and heat pumps in Ontario have any significant rebate program. Heat Pumps installed Maine only receive grants if they are done via ductless or hydronic fan coils and the rebate is capped at $750. Homeowners installing a heat pump in BC also are only rebated for ductless style heat pumps. Other popular heat pump regions like New Brunswick have programs of $1500 for fully ducted heat pumps. Bottom line is the growth of cold weather heat pumps in North America is on a significant rise with or without grants and rebates. 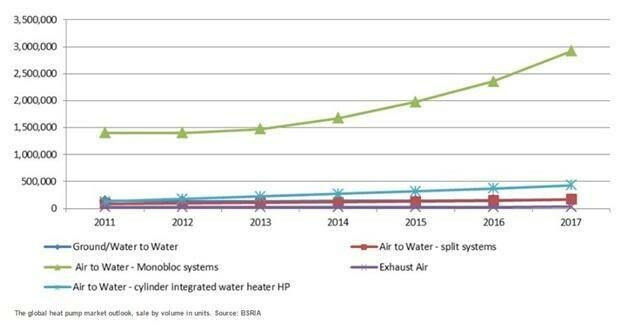 This is good news for heat pump manufactures as it is a signal of consumer acceptance and natural ROIs (without rebates) which is resulting in more and more home owners leaning towards air to water heat pumps for their energy saving solution.